RSVP are spearheading the renaissance of live Bhangra in the UK, opening doors for other artists and introducing Bhangra to mainstream audiences for the first time. From massive stages at Glastonbury (5 years in a row) and Womad, to concert venues across the UK and Europe, they're always guaranteed to get even the most reluctant on their feet, and leave audiences breathless with excitement. Every show comes with an introduction to Bhangra dance - everyone's included with RSVP's emphasis on partying Punjabi style. With musicians wholly rooted in an authentic living tradition, yet unafraid to innovate, this is the ultimate celebratory Indian music. Don’t take any chances….book RSVP! 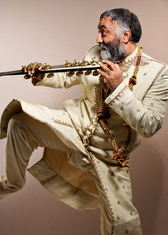 "RSVP began over twenty years ago when Dildar Singh gathered together family and friends to form the band. Within a year, RSVP had performed at Womad and have continued to delight audiences ever since, with performances including Glastonbury, Larmer Tree, Port Eliot,Bath International Festival, Reading Festival, Beautiful Days, and a host of other live music events, as well as touring internationally. Dildar - the lead singer and guiding light behind RSVP is a charismatic and fun loving man. He brings energy and huge stage presence to the band. His vocals are smooth and rich, but he has the strange ability to bring power and energy at the same time. Jeevan is Dildar's eldest son and seems to have inherited Dildar's charisma and musical flare. 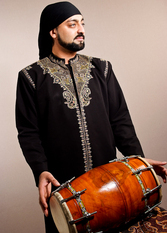 He is an excellent keyboard player, but Jeevan's true skill is with Percussion..... be it drums, Dhol, Dholak or Tabla, Jeevan produces beats to die for!